This blog post will guide you through the basics of BioVinci. You will be surprised at how simple it is. You will land on the home screen once you start the app. 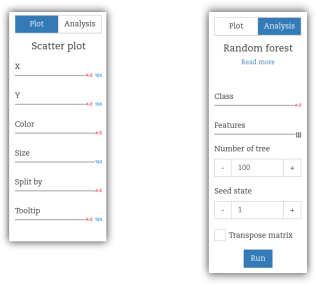 Here, you can import your data, access examples, and go to your previously saved and shared plots. Figure 1. BioVinci home page with 3 main groups of buttons: (1) Worksheet controller, (2) Import data, and (3) Documentation. (1) Worksheet controller allows you to browse through the examples, your saved projects and previously shared plots. Figure 1 shows the example gallery tab. You can launch these examples to see how to structure and input your data. (2) Import data button lets you manually input data, or upload the entire dataset (supported file formats include CSV, TSV and Excel). (3) Documentation allows you to access a complete guide of BioVincifunctions. Click Import your dataset on the main window or any plots in the example gallery. You can upload your file (CSV, TSV, or Excel) or enter the data manually (see Figure 2). The data should be structured in a table (or matrix). For Excel and similar worksheet editors, you should clean all irrelevant titles and information, and just upload the main table to BioVinci. (1) Workset title: this field is required, otherwise you cannot progress to the next page. (2) First row as headers: Check whether the first row is the column’s labels. (3) Number of replications: If your data contain merged column labels that show replications in your experiment, you have to input the number of replications so that BioVinci can understand your data. More on this in ourblog. (1) The tool bar shows the available functions for your project. Add data: enter a new dataset apart from your current one. Your newly imported data will show up on the data panel (2). Edit plot: open the edit mode, where you can customize your plot features. Clean plot: clear all inputs in the input panel (3) and the plot area (4). Export: export the data in various formats (SVG, PNG, and PDF for pictures and CSV for statistic results). Statistical results: this button only appears when you use the statistical functions. Figure 3 shows a basic graphical function as an illustration. 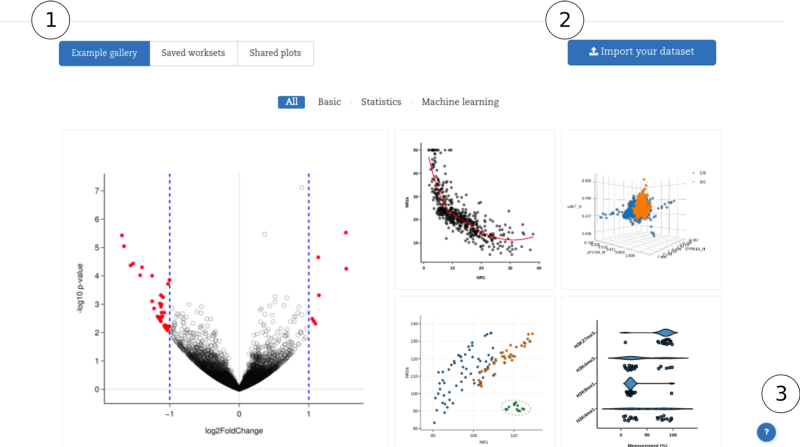 Suggestions (on the far right): you can hover the mouse over the thumbnail to see what statistics BioVinci suggests for your data, and click to apply it if you want. (2) The data panel: show the structure of your data in terms of column labels. If no labels are given, BioVinci will set them as X1, X2, etc. The tiny figure on the left of each label shows the column type. The first two columns (Hours and Factor2) are categorical columns and the last (Value) is numeric. 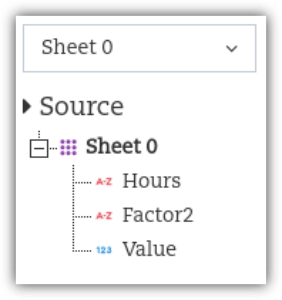 You can switch to your newly created variables in the drop list (shown as Sheet 0 in the figure 4). 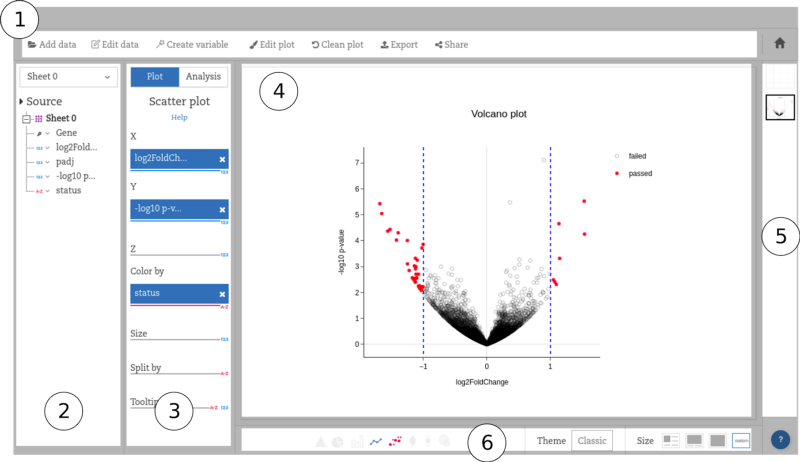 (3) The input panel: drag your data from the data panel (2) to the placeholders to create plots or run analyses. The input panel is different for each function. Draggable items include columns and matrices. (4) The plot area: This is where your plot appears. Some statistical results can have more than one plot. In this case, the plot area only shows the first plot. Users can switch to different plots using the drop list at the far left of the plot icon panel (6). (5) The gallery panel: present all the saved plots/results of the current project. You can click a thumbnail to open a saved plot/result. (6) The plot type icons: highlight the current plot type and show all possible plot types. You can also control the size and theme of the graphs. BioVinci has various settings that can quickly make a graph publication-ready.